Today was a cool and overcast morning, which is a very nice change from the withering heat we’ve been having lately. The ride was Gene’s “Atonement Ride”, which he’s been talking about since spring. It has some big and steep hills, so it wasn’t really an appropriate ride for a hot day. So today was the day. I asked him what we were atoning for, but he said it was nothing in particular. We started out heading west across Pasadena, skirting the Rose Bowl and then heading up past JPL in to La Cañada. Then we took a right and headed up the hill. There were several steep stretches with short flats in between. Just enough to recover a bit before the next climb. By the time we got to the top, we were up high enough on the mountain that we were inside the low clouds. We came out by the golf course on Angeles Crest and then headed down. About halfway down the mountain, we turned off and did some more climbing. At the top, I noticed that James was making a puddle of sweat every time we stopped, so I had to take a picture. Then we headed down a very steep hill, which was kind of scary, since the road was wet. At one of the wet turns, there was a little patch of mud, and Jon slipped and fell. Fortunately, we were going pretty slowly at the time, so he just got a little elbow scrape. After a little cleanup, we continued on, crossing into La Crescenta and then down Ocean View into Montrose. We took a left in downtown Montrose and headed up Hospital Hill. Then we went right on Descanso and went down the hill for a bit before turning up Hampstead and up the hill again. At the top, we crossed over Chevy Chase and rode into Glendale, going up and over the hill to come out at Lida. It was here that I noticed that my bike computer had crapped out. It said I was going 0 down the hill, and I was pretty sure that wasn’t right. Going down the hill on Lida we came out on Linda Vista by the Rose Bowl and headed south to get to Glenoaks. Then it was time to climb the hill again. That was where I saw the little squashed lizard on the road. Then it was up and over, coming down on the other side just above Eagle Rock. A left on Colorado brought us back into Pasadena. Our snack stop was at the Corner Bakery on Lake. We all were pretty tired by that point, even though the ride wasn’t actually all that long. Still, it was nice to stop. The last part of the ride was straight back to the park. Vikki and I took off at that point and did one of our lunchtime routes out to Arcadia. We went up Highland Oaks and back across Sierra Madre on Grand View. After that, I said ‘uncle’ and decided I’d had enough. It was a fun ride. And I made it up all the hills in my 39×17. 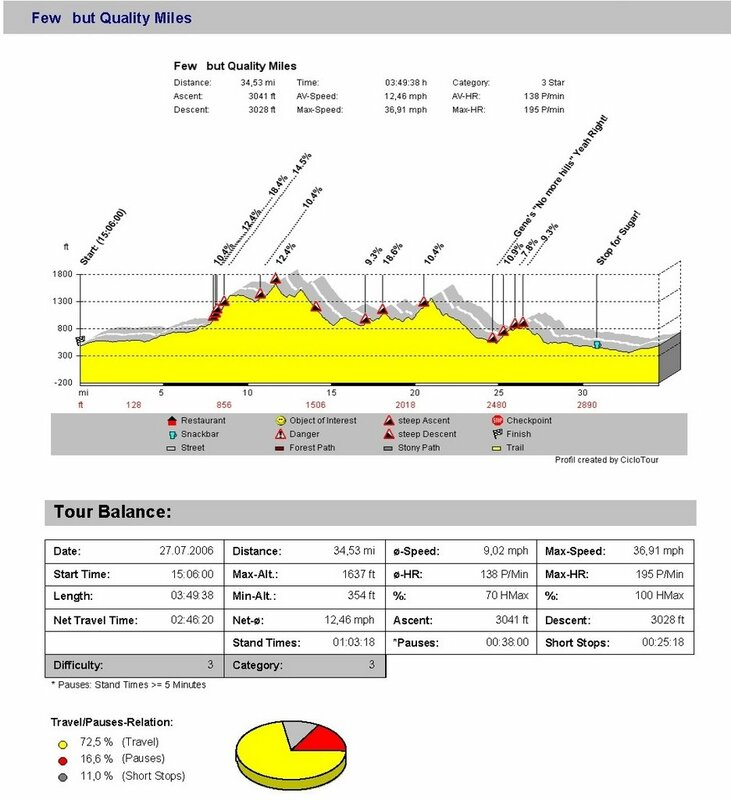 Addendum: Newton has the ride profile up on his blog. Today’s ride was the Lida Loop again. I rather like that route for a mid-day ride. It was another hot and humid day today. Yick. On the way up the hill on Lida, I saw the discarded packaging for a “Flexidong”. I guess someone was in a hurry to get it out of the package. This was sort of reminiscent of my days riding in the Hollywood Hills, when I used to find lots of women’s clothing scattered along the road on Sunday mornings. Coming down the other side of the hill, I rode past JPL and back into Pasadena. I saw Shannon outside her house, sweeping the sidewalk. So I stopped and we chatted for a bit. Continuing on, I took a side trip to Mountain View Cemetery again, this time to look for Charles Richter’s grave. But all I had was the area and not a curb number, so I couldn’t find him. I’ve asked some people at the Seismo Lab, but nobody knows exactly where he is. The last part of the ride was down Holliston and back to the office. That two miles downhill is always nice on a hot day. On the way home from work, I saw some more filming going on. They had the street blocked off, but they said it was all right to ride through, so I didn’t have to detour. Last week I sent a link to a picture of an octopus tattoo to P.Z. Myers at Pharyngula. I thought he might find it amusing, since he’s a big fan of cephalopods. He included the link in one of his posts, and today I noticed just how many people came to have a look at it. I guess P.Z. has a very substantial readership, since that little link made a big impact here. I know from experience that only a small percentage of people will follow any particular link on a site, so I can just imagine what his daily traffic is like. It was our first day in a long time of over 3000 site visits, and our first-ever day with over 1GB of traffic. It’s not quite the “Slashdot Effect“, but it’s still interesting to see. Today we went over to Hollywood to The Knitting Factory to go to “Baby Loves Disco”, which is an afternoon disco party for kids. We had read about this in the L.A. Times this week. It sounded like fun, but as it turned out, it was mostly kids much younger than Lucinda. Most of the kids there were babies and toddlers. So Lucinda was older than most of them. She still had some fun, but it wasn’t as good as it could have been if there were more kids in the 6-9 range. After that, we walked down Hollywood Blvd for a bit. Lucinda wants to get a fairy backpack for school, and we thought we might be able to find one there. We immediately got caught in a crush of people in front of the Chinese Theater. Apparently there was some sort of event there and they said that Julia Roberts was supposed to be there. So we had to push our way through throngs of people in monsoon heat to get past. We didn’t end up finding a fairy backpack, but we did find a nice zebra-pattern bag for Lucinda to use for when she goes to swimming lessons, so it wasn’t a waste. And Lucinda was very amused by the Ripley’s Believe it or Not museum at Hollywood and Highland. She wants to go back there some time. Today I met Gene for a ride out to Encino to the velodrome. I had heard that they were going to be doing 1/10-scale radio-controlled model car racing there. I thought that this would be something interesting and different to see. On the way out, we stopped off at the tiny house we’d seen back in April. We wanted to see if it had sold, and indeed it had. It had a new coat of paint and an owner out tending the garden. We chatted with her a bit and we were glad to see that the tiny house had found some love. When we got to the velodrome, some of the racers were doing practice laps. The cars were going quite fast. Oddly enough, there was a rather attractive young woman with a camera crew there. Given that radio-controlled race cars are kind of a geeky hobby, her presence seemed a bit odd. So we asked them about it. They were from The Outdoor Channel, which has a show called Inside R/C. So they asked if we wanted to be in the sign-off for the show. We stood on either side of the host, Anna Curtis, while she recited her spiel. She finished with, “and now it’s time for us to go, because these guys want their track back”, while we just smiled stupidly. It was fun. They said that the show would probably air in the fall, so if anyone has cable and can get me a screen-capture, that would be great. We left the velodrome and headed back across the park. We stopped to refill our water bottles at the water fountain right below the sign warning that ‘lewd conduct’ would be prosecuted. I’m not sure I want to know what goes on in that park after the soccer games are over. We took Burbank Blvd to Van Nuys and then went down to Chandler, which is a nice, tree-lined street. The shade was a good thing, because I got a flat there. So we stopped in the shade of a big tree and I fixed the tire. The eastern part of Chandler is where the Orange Line busway is, and we got a look at the big articulated bus. It was very quiet, which is maybe why when it first opened it broadsided lots of cars on the cross streets. On Riverside Drive in Toluca Lake we saw the Barris Custom shop. He is perhaps best known for building the 1966 Batmobile, but his shop makes a lot of weird vehicles for the movies. In Glendale we stopped at a Carl’s Jr. and got some cold drinks. I filled my water bottle up with ice and water and then drank the whole thing twice. We sat in the air conditioning for a little while before braving the heat again. In Eagle Rock I hit the proverbial wall. There was no shade and it was well over 100 degrees. I just started riding slower and slower. On the Colorado hill I actually shifted down to my lowest gear and just crawled up the hill. Fortunately, after that there were no more hills. But we had to stop at Memorial Park in Pasadena so I could lie down in the shade and pour water on my head. I think I had heat exhaustion. It was so bad that for the rest of the ride home, I put my foot down at every light, rather than doing my usual track stand. And at the end, Gene rode with me all the way to my street just to be sure that I wasn’t going to keel over. When I got home, the thermometer on the back porch said 110 degrees. That’s about 44C for non-USAnians. I drank my water bottle four times on the ride, which is over 3 liters of water, but I was still 7 pounds (3.2kg) lighter when I got home. Yikes. 59 miles, one flat tire, and heat exhaustion. Today’s ride was a solo effort. I’d forgotten that Vikki was going on vacation, or “on holiday”, as she says in her Canadian parlance. But it was a nice day, so I went anyway. Leaving campus, I saw a car with a couple of “Wizard of Oz” murals painted on it. “Don’t make me get my flying monkeys!” Then I rode through Old Town and past the Rose Bowl to the hill on Lida. On the way up Lida, I saw a makeshift memorial on the side of the road for “Blue Boy”, which I gathered was someone’s bike, destroyed in a collision with a car. I guess that means that his owner wasn’t too seriously hurt, which is a good thing. At the top of the hill, I saw another “Lost Pet” sign. This time it was for a desert tortise. Last week it was a lost snake. There are people who think that lost dogs and cats can predict earthquakes. So what could a rash of lost pet reptiles foretell? Global warming? Heading down the hill, I made the loop back into Pasadena. I took Ventura across to Fair Oaks and then took a small side trip to Mountain View Cemetery. I’d read recently that this cemetery is used a lot for filming, and apparently today was no exception. There were two separate productions going on there. I rode past both of them to find the grave of Richard Feynman, the Nobel Prize-winning physicist from Caltech. When I was a physics major in college, Feynman was a legend. Reading his book Surely You’re Joking, Mr. Feynman was entertaining, inspirational, and it also taught me how to pick locks. Truly a lasting legacy. Leaving the cemetery, I rode the rest of the way across Pasadena and then down the long hill back to the office. When I got there, I took a Myspace-style portrait in the reflective glass of the back door. Today’s bike ride was a route that Gene selected because it goes on a lot of tree-lined streets. The idea was that the route would have lots of shade. It was already hot at 8:00 in the morning, so we were glad for the choice. We rode across Pasadena and up into La Cañada. Then we went down Hospital Hill in to Glendale. That was where I saw the “Lots of Pets” car. My first thought was to wonder if they had gotten permission from Mattel for the logo, which was a takeoff on “Hot Wheels”, but the Supreme Court decided that parody is a protected form of free speech, so maybe it’s not a problem. At the bottom of the hill, we turned and took Mountain and Kenneth across Glendale. We stopped at Paradise Bakery. I had my usual two chocolate eclairs and a quart of water. After the stop, we headed into Griffith Park and rode through the park down to Fletcher, where we turned and started back home. Some guy without a helmet joined up with us for a bit on Riverside before we turned off. Then we headed back through Atwater Village to Eagle Rock. We rode across Eagle Rock and into South Pasadena. Then we went north into San Marino and back into Pasadena. And then, POW!!! Doug’s back tire blew out. I immediately whipped out my camera and took a picture for the Flat Tire Gallery. Since he was almost home, he said we should just go on. So I rode out to Arcadia with Newton and then came home by way of Sierra Madre. Today was the summer edition of the big Body Art Expo at the L.A. County Fairgrounds. A lot of the tattoo purists don’t like this show, because it’s not put on tattoo people. But at the same time, they promote it well, and it draws a big crowd. So it’s something that’s accessible to the masses. It was hot out there in Pomona today. I got there about 3:00 and just about roasted while waiting in line for my ticket. And even when I got inside, it was still hot. But that’s all right. High temperatures tend to encourage people to take off their clothes, which is a good thing at a tattoo convention. I saw my friend Rick down at the end of the hall. He was posing various girls on a motorcycle there and taking photos of them. The bike’s owner was threatening to put the seat up for sale on EBay after Rick was done. And one of the girls was Trisha, who we saw at the Erotica L.A. show a few weeks ago. She had her hair down today, and as always, she looked great. Shannon had a booth at the show this time. I stopped by a couple of times and she was busy all the time, so I think the show was good to her. I also saw Anna from Anagram Fine Art there. We chatted a bit and I also pawed through her kids-size shirts to see if she had one in Lucinda’s size. I saw a half-leg tribute to Elvis and Marilyn Monroe, as well as some permanent makeup and a very nicely done octopus tattoo. I saw my friend Tina there, too. She was in a wheelchair, since she had had surgery on her leg and was ordered not to walk for two months. So I volunteered to push for a while and we went around and visited with some of her other friends. It was a fun time, and the pictures are in my tattoo convention photo gallery. We recently saw that the Go-Go’s were going to be playing a show at the Greek Theater in honor of the 25th anniversary of “Beauty and the Beat”. Cathy and I both saw them back in the early ’80s when we were young and single, and we also went to their reunion show in 1989 when we were married. So we thought it might be fun to go and take our daughter along. She knows all the songs, and she thought this sounded like great fun. We had an early dinner and headed over. We got parked in solid there and walked into the amphitheater. It was dusk when we got there. The opening band was Morningwood, and they were very good. Lucinda didn’t ask what their name meant, which was probably just as well. The Go-Go’s took the stage at about 9:00 and their first set was all the songs from “Beauty and the Beat”, which was a nice trip down memory lane. It’s hard to believe it’s been 25 years, and their songs obviously appeal to the younger crowd. There were lots of people in our age bracket there with their kids, and the kids were all singing along and looking like they were having a great time. The first time I saw them was in 1981 at a tiny little club in Houston. My friend Mike got free tickets, and we spent the entire show pressed up against the stage, practically looking up Charlotte Caffey’s skirt. But it was Jane Weidlin that we all fell in love with. She had the best stage presence and personality, and we all left there that night with a huge crush on her. And tonight she showed that she still has it. She bounced around the stage, and my crush was renewed again. But then again, I’ve always had a thing for cute girls with short black hair, even if they are in their 40s. We got lucky in that their was a mom and her young daughter sitting next to us, so Lucinda and the other little girl enjoyed watching the show together. They danced in the aisle and sang along. It was very cute. Towards the end, Lucinda started to get tired, but the show ended at 10:30, which wasn’t too late. The Greek has a curfew due to the houses nearby, so the shows there never go late. When it was over, we headed home. It was a fun little adventure. Today at lunchtime I went riding again with Vikki. She’s training for Ironman Canada in August, and she ran something like 14 miles in the morning, so today’s ride was a little slower than usual. But it was still a fun time. We did the same Lida Loop we’ve done several times before. This time we saw some filming going on in Old Town. Then we rode past the Rose Bowl and up the hill into Glendale. Then we rode down into La Cañada and then back into Pasadena. We usually go down Holliston to get back to the office, but today Vikki suggested a side trip. She had been reading American Bungalow in the dentist’s waiting room, and they had an article about Reinway Court, which is off Los Robles in Pasadena. So we went to see it. It’s a little bungalow complex. Many little houses that look like they are from the 1920s or so, all on a fairly large lot. Apparently, the family that owns it has had it for many years, and they are restoring all of the units, and they are going to be for rent. It was interesting to see. The last part of the ride was down Green St and back to the office. It was a nice ride. On the way home after work, I saw a sign pleading for the return of a lost pet snake. And then I saw that a house down the street from mine is for sale again. This is the house where they filmed a scene for the new “Nancy Drew” movie. It sold a few years ago for something like $600,000. But the real estate market here in L.A. has slowed down a lot since then. My guess is they won’t be able to get that for it today. But we will see.